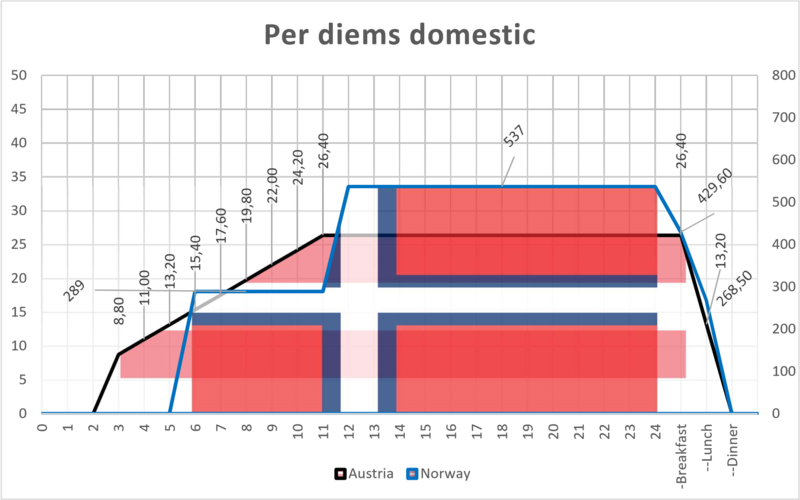 Building upon my insight into travel expenses and per diem calculation in Germany, let us consider Austrian and Norwegian per diems side by side. In both countries scaled rates per hour apply, and in both counties rules for the domestic travel and for traveling abroad differ. 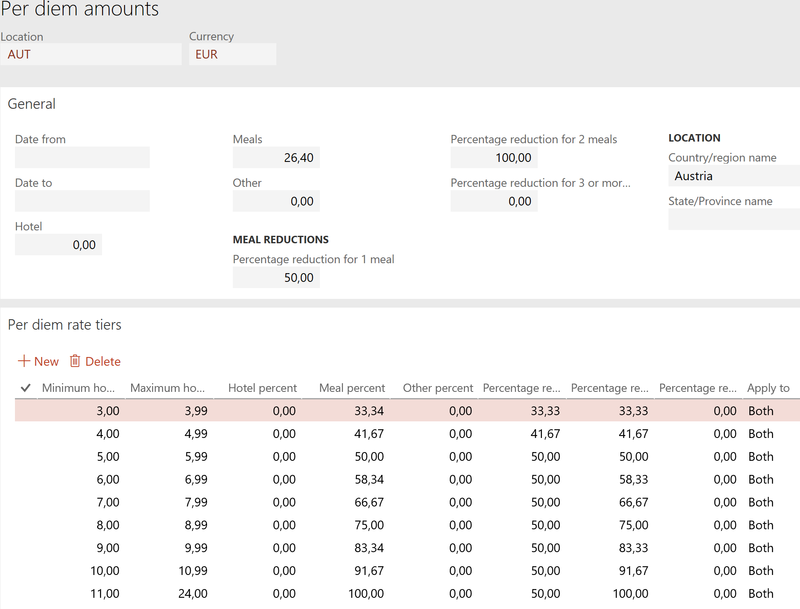 Both countries can be implemented in Dynamics 365 for Finance and Operations with literally no customizations at all! In Austria, the first 3 hours of domestic travel are not reimbursed, but once the duration of the trip reaches 3 hours, the employee becomes 4/12 of the full rate of 26,40 euros. These 8,80 euros apply to a trip with a length between 3 and 4 hours, from the 4th full hour the rate increases to 5/12 and so on. From the 11th hour the full rate 26,40 applies. A multi-day trip from the 01.05.2018 10:00 to 03.05.2018 13:10 is divided into 24-hour periods + the number of remaining begun hours: 2 days + 4 hours = 2 + 4/12 of the daily rate = 2,3333 * 26,40 = 61,60 euros. In Norway, a domestic trip starts monetizing after the first 6 hours, the employee becomes 289 NOK. Contrary to Austria, in Norway there are just 2 steps: one for 6-12 hours of 289 NOK and the full 537 NOK for anything between 12-24 hours. 24-hour periods are counted, but the last day of a multi-day trip counts as a full one as soon as the remainder exceeds 6 hours. I.e. a trip from 01.05.2018 10:00 to 03.05.2018 18:10 gives 2 days + ~8 hours = 3 daily rates = 3 * 537 = 1611 kroner. A Norwegian speciality is a higher overnight stay rate of 733 NOK, while no overnight is 537 NOK. Should the employer or customer provide free meals, the daily rates begin to decrease. 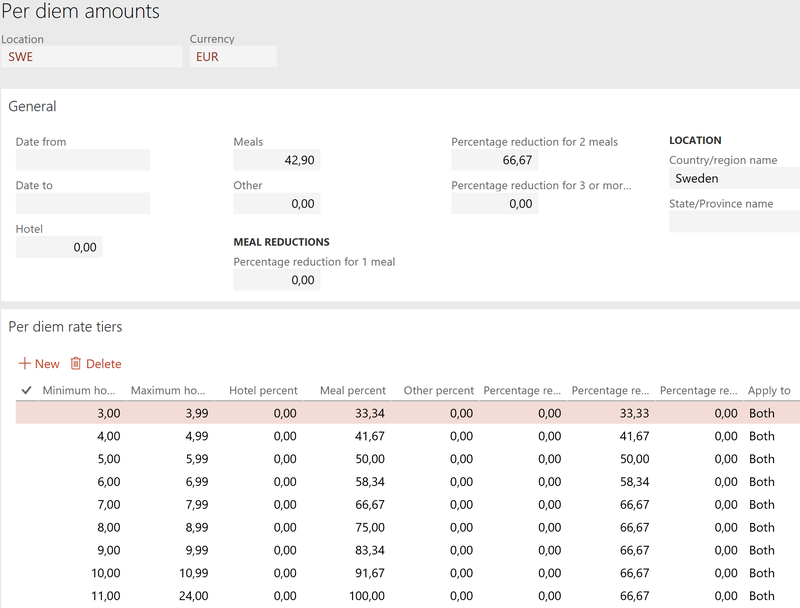 In Austria, a domestic lunch leads to 50% reduction and the dinner reduces the daily rate to zero: 50% – 50%. 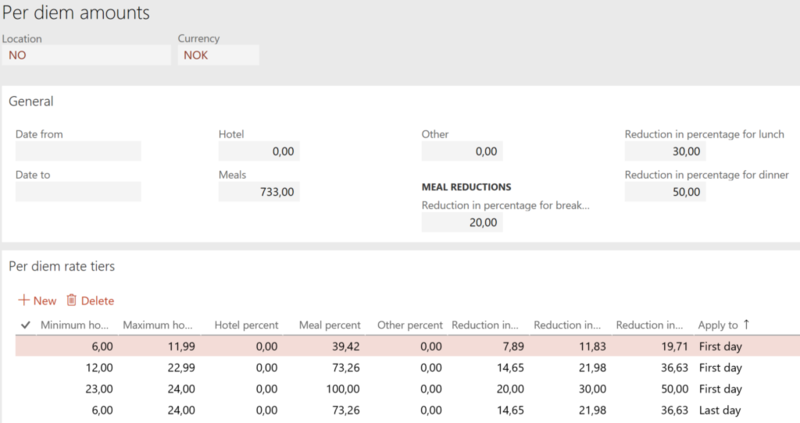 The percentages refer to the full rate of 26,40 EUR, and a single lunch reduces a short 3 hours trip to zero: 4/12 – 1/2 = 1/3 – 1/2; the per diem amount may not become negative, though. Both countries maintain tables of detailed per diem rates for numerous destinations abroad, and account for some expensive capital cities. In Austria the same X/12 rule applies to every destination abroad. 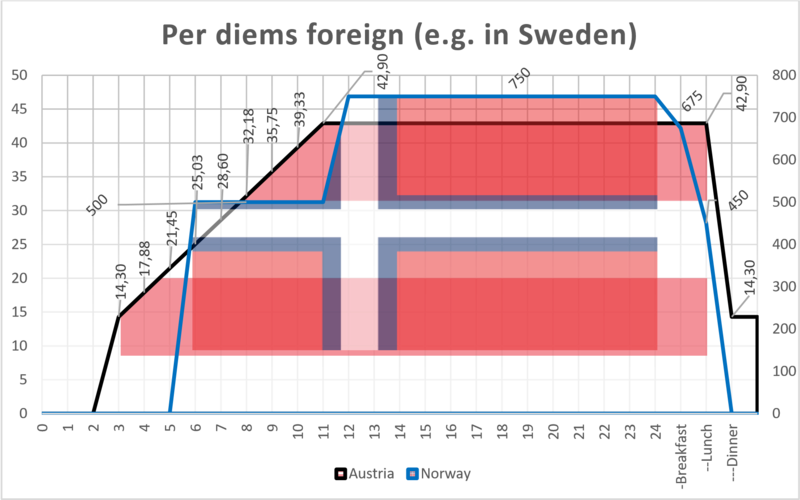 In Norway, the first 6-12 hours give 2/3 of the total foreign rate, and more than 12 hours give the full rate. This time, no exception is made for an overnight stay. The Minimum hours for per diem parameter is 3 hours (Expense management > Setup > General > Expense management parameters), Meal percent = 100, and Base per diem calculation on = 24 hour period. The deduction for the breakfast used to be a grey zone in Austria: in the past there was an own percentage of reduction for breakfasts. This regulation was eased, and now only lunches and dinners count. In case of a travel abroad, one lunch or one dinner do nothing; only 2 meals lead to a reduction of 66,67%. 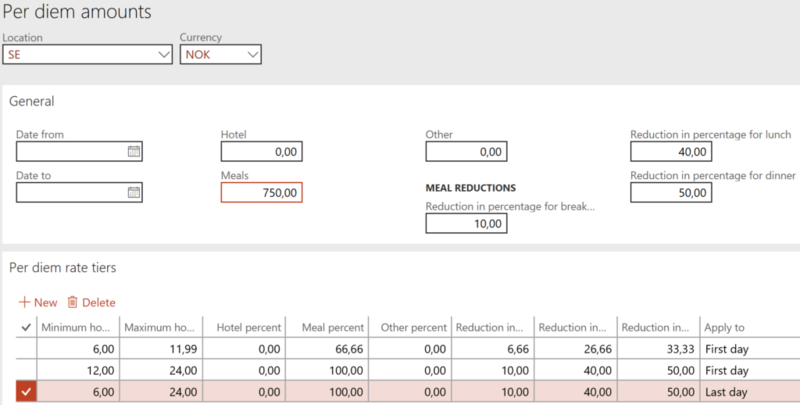 I suggest using the mode Calculate meal reduction by = Number of meals per day, while preventing the breakfast entry by the Expense management > Setup > General > Expense report fields setup. The user should not be entering more than 2 meals per day. This amounts to 13,20 EUR. For Norway, the Minimum hours for per diem parameter would be 6 hours, while Calculate meal reduction by = Meal type per day, because the breakfast, lunch, dinner all lead to a reduction by a specific percentage (20% or 10%, 30% or 40% and 50%, respectively). Breakfasts should be enabled for entry. The Norwegian krone is a relatively light currency, the 0,01% precision of Dynamics’ configuration starts making a difference, and Per diem rounding needs to be set to Always round up, thanks to all the rates aligned to whole kroner.